Join an Aussie drifter named Alexi as he walks around the Mooneyes Street Car Nationals- a massive hot rod show that goes down in Tokyo every year. 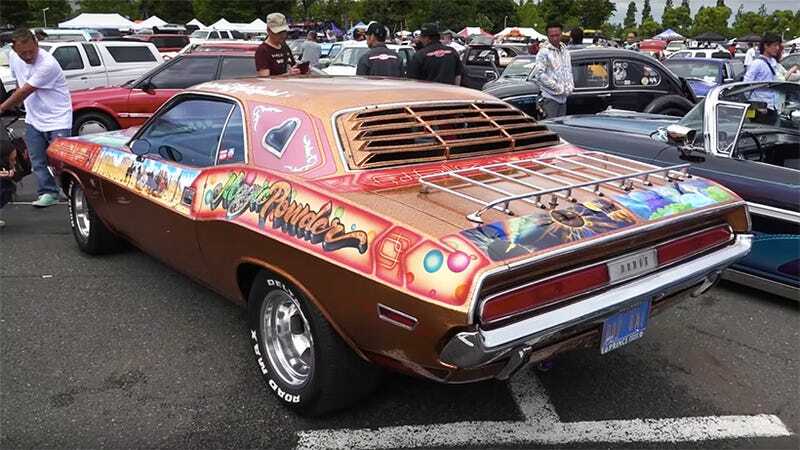 The parking lot is thick with muscle cars, but it gets a whole lot more interesting than that. As Alexi explains in the video, Mooneyes is a purveyor of weird car accessories that’s been part of the muscle car scene since forever. At the 31st holding of the company’s Tokyo show, there were apparently over 1,000 vehicles on display. Even just scrubbing through this video is a feast of vans, rat rods, classic muscle cars, derelicts and I think I even spotted a few wacky bicycles in there. Seeing all this amazingness makes me want to get back into my own garage and start attacking the long list of car customization projects I want to do to my own ancient off-roader. Good thing tomorrow’s the weekend!